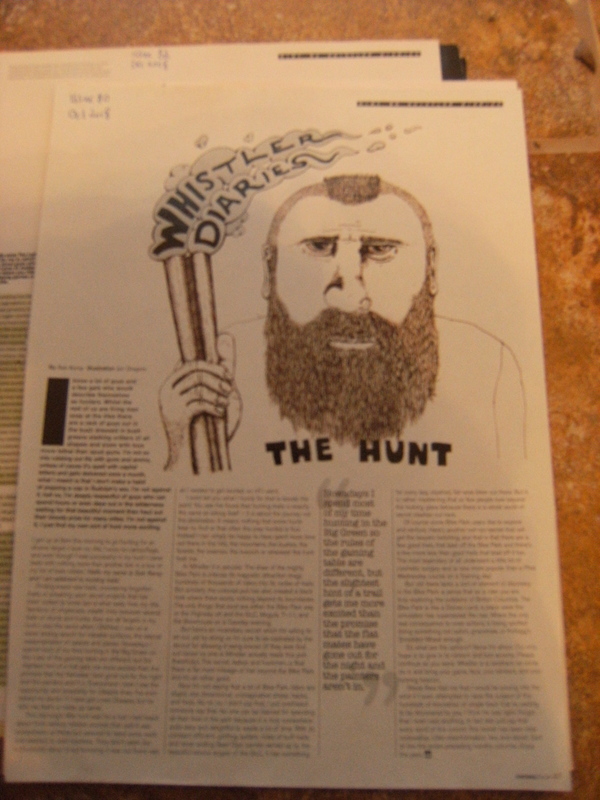 First up, ‘The Hunt’ from issue 80 of Dirt Magazine. I wrote this on a cold fresh blue sky afternoon right at the end of August 2008. I remember the walk so clearly. I had just got back from three months in Whistler. Three months that should of being five or six but pressure from the then fiancee forced me to return to Queenstown early. Just days earlier I had jumped in a sea plane destined for Vancouver. Normally I would take the cheapest form of transport to get anywhere, but this time i had felt like spoiling myself. Partly because I was secretly choked to be leaving Whistler right in the middle of the summer, and secondly because the day before had been the last day of the Crankworx uber party festival. That penultimate day in Whistler had been a blast. Todd hellinga, Carlos Zavarce had set out to explore more than just the event, we had taken a journey into our minds to explore the event…more can be gleamed by reading issue 81 of Dirt Mag ‘7 Chapters of Crankworx’ or ‘A necessary altered state of consciousness’ as it got called by Dirt because of its contents. Anyway, where was I? Oh yes, leaving Whistler. Leaving Whistler on that little prop engined sea plane was a trip. The day was sunny, clear and afforded me an endless view of the mountains of the Sea to Sky that I love. From the little planes windows I could see routes, logging tracks, trails and endless wilderness from a totally different view. It seemed there was so much to explore. I try every summer in Whistler to explore everything and everywhere, but looking down from that vantage point I realised how much more there will always be to explore and see…more than i will ever be able to see and explore. So, once i got back to Queenstown and the missus and me had shattered each others pelvises after a three month drought, I got straight back into the woods, mountains, and secret hideaways of Queenstown and the surrounding area to find trails…either old disused trails, or trails that hadn’t exactly been actualised as trails just yet. Potential. One spot that always caught my imagination the summer before in Queenstown had been Queenstown Hill, an area of limits to bikers but seemed to juicy to ignore. I mean come on, it’s right in the middle of town (access), has good altitude (400m? ), good pitch (not as steep as Skyline/bobs peak but still hella steep), and had good varied terrain. A good friend, Adam Mantle (aka protein fiend aka the Mantlelope aka the Hoff) had said that he found an abandoned trail called Goats Head the year previous. That got me thinking, why would there be a trail right in the middle of town but no-one used it or knew about it? Tasty morsel or smelly red herring? I got up early with the missus that morning and walked her to work, grabbed a coffee for takeout and started the walk up the hill from town. It was a beautiful late winter day, blue empty skies so full colour and the air was still and frigid. The ground was crisp, the leaves had begun to poke their heads out to see if Spring was around yet, and it was just me and the Pod tramping in the woods on the Hunt for trails. Such good times. I’ve spent countless days searching potential areas or zones for trails. I love it. I get a buzz from it. It’s like being a cross between a hunter and an investigative detective. If you’ve done it enough you become so skilled that you can almost sense where trails will be. Of course you can’t really sense where the trails are, its just that your skills become so second nature that you zero out on the how and just zero in the where. A friend and myself had once gone on a huge trails (dirt jump) roadtrip throughout Australia years previous. We were armed with just a magazine that contained just the names of some trails. We found everyone of those spots. We knew the areas of greenbelt that would be utilised by BMXers because we did the same and dug hidden spots at home in the UK. We looked out for tire tracks in the dirt. Litter (or lack of). Broken branches. These were all the tracking evidence we needed. This was just some of the info that we needed CSI style to find the trails. Hunting mountain bike trails is the same. You look for patterns or the absence of patterns. There are clues everywhere. So I found this Goats Head trail pretty quickly. It even had a sign twenty metres down the trail. It was (is) a fun trail. Flowly, fast, pretty smooth up top, then gets tighter and more loose. lots of steep, fast off camber pine needle goodness down the bottom makes the rider feel like a drifting god. The second half is tighter still and has a nasty tight steep swithc thats exposed, rooty and has a tight thread-the-needle exit between two yound trees. But I digress, hunting. That hunt for trails or potential areas for trails is elemental to mountain biking to me. Just buying a map and joining the coloured dots together is fun in the sense thats its easy and you are more likely to get a lot more quality riding in. This is great if you are visiting somewhere and have limited time. However, for you home spots then you just have to get out and go hunting. Go look at some quality maps (or google earth these day) and figure out some places that might have potential. Go listen to whispers and rumours. Get buzzed on finding the hidden. Go ride somewhere new or get off the bike for a change and go bushwhacking. You never know what you might find. You may find some gold, and treasure, or you may not. Either way you win, because if you don’t you’ll still be able to scratch one more place off the lost of potential and narrow down the search for the Goonie treasure. Or you might just have a really relaxing tramp or wander through natures finest. That’s good for the soul. December 14, 2009 in BRITISH COLUMBIA, DIRT MAGAZINE, LOOK AT ME MOM!, N-ZHRED, WHISTLER DIARIES - THE BACKGROUND. Aha, so you are writing! Bookmarked you.